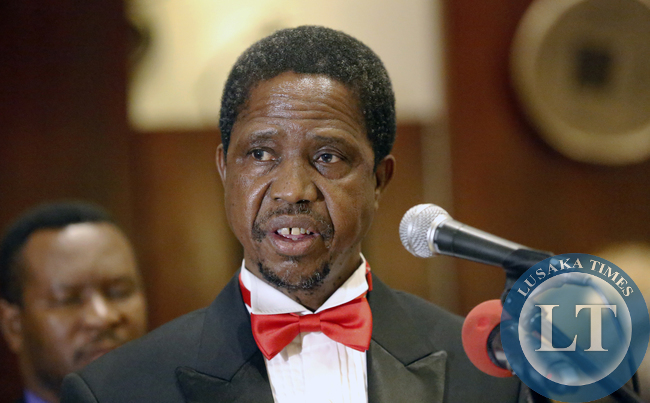 FILE: President Edgar Lungu address Law association of Zambia 2015 annual General Meeting and Gala Dinner at Zambezi Sun Hotel In Livingstone on Saturday PIcture By EDDIE MWANALEZA/ STATEHOUSE. PRESIDENT Lungu has said that ratings by international and local organisations that corruption is declining in Zambia, attests to Government’s zero tolerance to the vice. In a televised address to the nation last night to launch the United Nations anti-corruption week, President Lungu said that he will not shield corrupt government officials. Data by various organisations shows that Zambia has made significant progress towards curbing corruption. Transparency International’s corruption perception index (CPI) rating between 2010 and 2014 indicates that corruption levels in Zambia are decreasing. From a score of 2.6 out of 10 in 2001, Zambia has improved to a score of 3.8 out of 10 in 2014,” he said. Further indications are that in the past five years, Zambia has improved its score from three in 2010 to 3.7 in 2012 and 3.8 in 2014. President Lungu said that another research by Ibrahim Index on African Governance, an international study conducted every year by the Mo Ibrahim Foundation, shows that Zambia is making progress in the fight against corruption. President Lungu said the Ibrahim Index further shows that Zambia has improved and is placed at 15th position in Africa with regard to accountability and management of corruption in 2015. “The highlighted achievements signal Government’s resolve to the fight against corruption and desire to meet the convention’s concerns for state parties to establish effective corruption prevention mechanisms, as a first step towards tackling the scourge,” President Lungu said. He said his Government has been firm in ensuring that public officials found wanting, including senior officials, are investigated and prosecuted. The President said the fight against corruption continues to be high on Government’s development agenda. “Let me assure of our continued support to the institutions that are mandated to combat this vice,” he said. The President further urged Zambians not to allow graft to be embedded in social systems because it is an impediment to development with negative effects on economies and households. “Corruption weakens democratic institutions, perverts the rule of law, discourages investment and aid, undercuts public confidence, feeds inequality and disenfranchises large segments of the populace,” Mr Lungu said. He said it is gratifying that the Anti-Corruption Commission has continued to devise new strategies against the vice, adding that the implementation of the national anti-corruption policy has been progressing well. President Lungu urged Zambians to participate in the week-long anti-corruption awareness activities across the country. During this period, he said people should reflect on the devastating effects of corruption on the economy and individual lives, and choose to reject the vice. Does that mean that he is giving himself up to ACC? Iwe Lungu, corruption is happening right there in state house and you have done nothing about it. What about the $200,000 Kaizer Zulu collected from Chinese businessmen in order to arrange an appointment with you? Have you forgotten that? Don’t lie to us Kaminamisa Lungu. Your boys Mulenga Sata and Chikwanda’s son are corruptly reaping from government contracts. Does the list exclude Dora and RB? This guy doesnt know if he is coming or going? Does he actually understand the subject he’s talking about? State house is a bed for corrupt elements and he says he will not shield Corrupt Elements, is he for Real? Kaizer Zulu and the Chipata Mafia are stationed at State House, charging business men for a fee to meet the President. Is it not him who stole a clients money? This Chagwesa Dziko is a silly a joke of a President! Aba bena nabafilwa!!!!! How is it that a kilometer of a Road is 20 times expensive in Zambia than anywhere else in the world? Does this drunk ever ask himself why we are paying so much for Roads? Is this govt really awake? How is it that road construction in Zambia is 20 times expensive than anywhere else in the world? Does this government ever sit down to ask why we are paying so much as a nation for Roads? Does RDA really do their job, I thought the only reason why we have such organizations is to get the best possible jobs for the nation but it seems our Govt is father Christmas to Chinese construction companies. What a Govt that doesn’t care how much they pay for Roads, because its not their money. Is this govt really awake? It’s not that they don’t care—those rip off prices are by design, PF are enriching them selves by pocketing the difference, they are all thieves. Only unfortunate policemen and traffic cops are arrested with some teachers. Lungu what of corruption allegations at FAZ? No one in your government has said a thing. You are all theives, don’t insult us. Arrest Kaiser Zulu and i will believe your cheap talk!! All of the above commentators are corrupt. You have evidence but you have not availed it to the police or ACC. Otherwise you are also corrupt for engaging in hearsay and speculation and telling lies about innocent people. When was Dora Siliya’s corruption case closed? @Saint, I’m guessing Austin Liato pardoned by Lungu was also not corrupt? …will not shield corrupt officials…he should have gone further to say he shall not associate, appoint or surround himself with anyone with traces of corruption…. …he would definitely remain alone probably with bana Tasila…. ..corruption is one of the many English words with diversity meanings…the word is subjective…even the Queen has failed to come up with a straight forward meaning of the word because the word itself is corrupt….